I am not a fan of the relatively modern trend towards narrower and narrower ‘genrefication’ of fiction because I believe it repels more readers than it attracts (though I’ll admit this is based on anecdotal and experiential evidence rather than the scientific kind). For example, my expectations that something with the ‘romantic suspense’ label would be too mushy for my tastes has put me off reading anything by Australian author Bronwyn Parry until, fuelled by a personal goal to read at least a smattering of books I wouldn’t otherwise read as part of my participation in the Australian Women Writers Challenge, I plunged into Parry’s third novel, DEAD HEAT. Happily for me it’s an absolute ripper of a yarn and its quota of mushy stuff is well within my personal tolerance levels. But I still think the book will miss a lot of readers (including, I’d wager, the entire male population) based on both its explicit and implicit marketing. 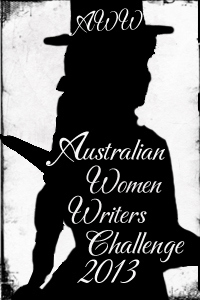 The novel takes place in rural New South Wales where Jo Lockwood is a National Parks Ranger. One morning while going about her normal duties she notices a kangaroo carrying the unlikely breakfast of a human arm and when she backtracks to where the roo came from she finds the body of a man who has been brutally murdered. Soon police, including Detective Nick Matheson, are on the scene. Matheson has only been in his job a few days, having recently transferred to ‘normal duties’ after ten years of undercover work. Unfortunately for everyone involved this murder is just one event in a series that will spell danger for the entire community. Be in no doubt, this is no cosy ‘all the violence takes place off-stage’ kind of novel! It’s clear Bronwyn Parry knows and loves the Australian landscape: through Jo’s eyes in particular the book shows both its beauties and dangers in stark reality. In fact it was more than a little eerie to read such well-described fire fighting scenes on the very day an unseasonally late fire was ripping through bushland a mere 20 kilometres from my safe city cottage this past weekend. The depiction of modern rural life was completed by the inclusion of the kind of community spirit that does engender small town life in Australia, in particular the human powered magic that is Rotary and its equivalent organisations. The authentic and quite enveloping setting provides an excellent backdrop for the cracking yarn which belied my ‘life’s slower in the country’ belief by not letting me stop for breath even once. There’s a rogue cop, international drug cartel links and a quite alarming number of dead bodies for something partially labelled romance but it all hangs together very nicely and made me eager to turn each page. You won’t be surprised to learn that Jo and Nick do form a romantic attachment but it’s not even remotely mushy and although the path to their love does not run smoothly the obstacles are not the cliché’s I worried about. Their respective back stories are drama-laden but believable and I found myself keen to know how their personal demons would work their way into unfolding events. 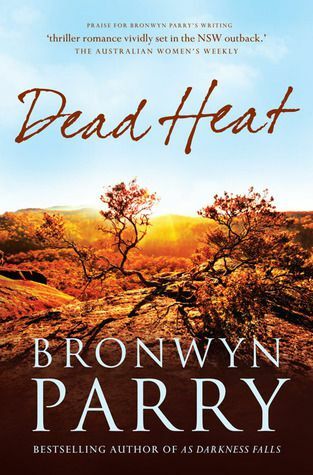 DEAD HEAT reminded me a little of Nevada Barr’s terrific series of novels set in American national parks which also feature a female ranger of independent spirit. The combination of evocative setting, suspense-filled plot and solidly built characters was very engaging and I will definitely be reading more of Parry’s work. She has won extra points on my personal scale because her books all seem to be standalones which, in this era of the never ending series, I find refreshing. Hachette Australia, 2008, ISBN 978-0-7336-2322-6, 358 pages. Some failures are worse than others. Most of us, when we fail, can mark it down as a lesson learned, and move on. But when your failure results in, first, the death of a child, and then, the death of a man you believe to be innocent, then moving on is almost impossible. For Detective Isabelle O’Connell, it was all made worse by the fact that it has happened in the town of her own childhood, and the dead child is that of people she grew up with. That was a year ago. The disappearance of another little girl in Isabelle O’Connell’s home town of Dungirri sends Detective Chief Inspector Alec Goddard from the State Crime Command in Sydney to offer Isabelle a chance of redemption, a chance to find and stop the perpetrator. Again the child is that of friends from Isabelle’s childhood. It is soon clear that by returning to Dungirri Isabelle is putting her own life on the line. Not everybody is pleased to see her. From the start too it is obvious that under other circumstances Isabelle and Alec would find each other very attractive. 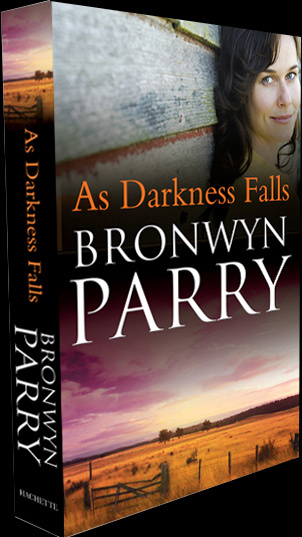 I went into reading WHEN DARKNESS FALLS knowing that it was a finalist in the Romance Writers of Australia Romantic Book of the Year Award 2009, in the Romantic Elements category. Prior to publication, the manuscript won the Romance Writers of America 2007 Golden Heart Award, for best unpublished Romantic Suspense. Now, I have read Nora Roberts, but mainly prefer her more noir writing as J.D. Robb, and romantic fiction is not generally on my reading platter, even when combined with crime fiction. I read WHEN DARKNESS FALLS so I can participate in an online discussion at oz_mystery_readers early this month. I was surprised at how much I enjoyed this novel. It was Bronwyn Parry’s first novel, apparently scheduled to be the first of a batch of 3. The romance element is well done, as both Isabelle and Alec struggle to maintain their separateness. I thought the crime fiction bit was well plotted too, and comes to a satisfying denouement. Parry clearly sets this in a dusty, parched, hot Australian environment but that really didn’t feel overwhelming. Dungirri is really just a closeknit Australian town on the edge of the bush, where every one knows every one else. It is town like most other small rural towns, where those who live there have mainly been there all their lives, where memories are long. I feel much the same about AS DARKNESS FALLS: it is an unusual blend of romance and crime fiction, to the point where in the book shops you will find it on the Romance shelves. Recently the Books Alive catalogue listed DARK COUNTRY, the sequel to AS DARKNESS FALLS, as “Mystery, romance, and suspense in the outback”, but not in the crime fiction titles. Perhaps, because I usually read a darker flavour of crime fiction, I don’t often come across this end of the genre. Bronwyn Parry’s own website is a goldmine. You can download the first chapter of AS DARKNESS FALLS, and also some Reading Group Notes.